Jared Gold is one of those organ players that uses the instrument more like a piano than an instrument to bang out chords. Like the legends Larry Young, Sherily Scott, or Jack McDuff, he uses his compositions and band mates to construct an impressive and unique environment around himself. Gold creates beauty within a soulful jazz groove that quickly becomes infectious. But you the listener will be more influenced by the performances of this quartet more than the idea of a funky groove. And that idea is clear and on display throughout All Wrapped Up, Gold's fourth album as leader. Opening with the fiery "My Sentiments Exactly," Gold makes a bold statement that this will be a heavy session but with a lot emotion and input from his fellow bandmates. This time around he circles himself with a superior lineup of Ralph Bowen, Jim Rotondi and Quincy Davis, all of whom have played with Gold in one incarnation or another. But on All Wrapped Up each member contributes to the session giving the proceedings a versatile and dynamic nature. Bowen is the real highlight on "My Sentiments Exactly" as he exchanges some tonal acrobatics with Gold that really get this piece smokin' during the mid-section. Awesome stuff. Another set of soulful notes occurs on "Piece Of Mine" which sees Bowen, Rotondi and Davis delivering some very romantic rhythms. Jim Rotondi continues to show why he is one most electrifying hard bop trumpeters on the scene today. He delivers some hard poppin' solos during this piece, while Quincy Davis and Gold share some head-bopping, toe-tapping grooves that holds the listener's excitement throughout. "Dark Blue" is as it sounds, more a deep ballad with Gold effectively shaping the sound from the outside in. He adds some deeply soulful tones that construct a more Jimmy Smith or Doug Carn atmosphere than the usual aforementioned influences. "Dark Blue" was written by Jim Rotondi, so it is expected that he would shine with delightful solos along with Bowen. "Just A Suggestion" sees the group really move into the funky Meters-type realm. Definitely a barn-burner if you hear it live. The group really lets loose and you feel the fire that builds up throughout the entire session really exploding on this piece. Gold gets the best beats out of Davis on "Just A Suggestion." A solid group effort to finish out the session. Jared Gold in just a few short years on scene has really established himself as an upcoming force on the scene as a leader and musician. All Wrapped Up succeeds not just because of the experience of the lineup but also the versatility of the quartets leader. 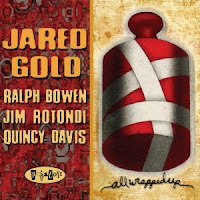 In All Wrapped Up, Jared Gold has made a fourth album that burns and soothes in both sound and composition.